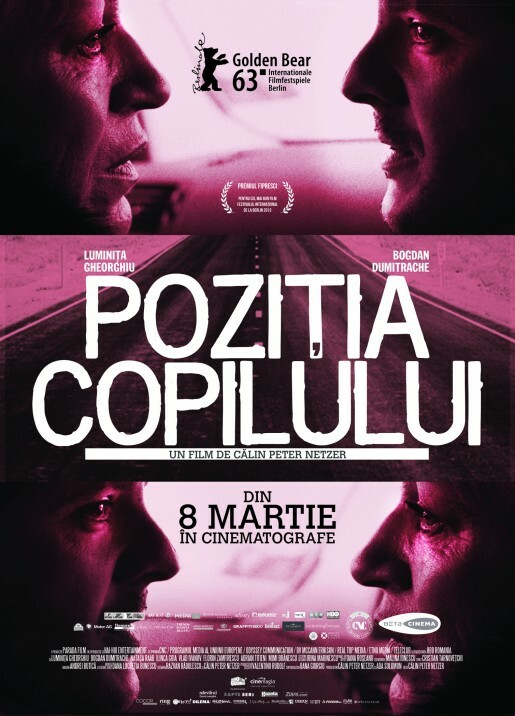 Child's Pose / Poziţia copilului is the third movie directed by Călin Peter Netzer. It follows Maria in 2003 and Medal of Honor / Medalia de onoare in 2009, both of which were nominated for and received awards in prestigious international film festivals. This movie reopened the door to Romanian film directors in the main competition (Class A) of the Berlin Film Festival, exactly two decades after The Conjugal Bed / Patul conjugal by Mircea Daneliuc. Moreover, Child's Pose surpassed its 18 competitors (including films by Steven Soderbergh, Gus Van Sant, Bruno Dumont, Ulrich Seidl, Jafar Panahi or Hong Sang-soo), taking first place in the 63rd edition (February 7-17 2013) in one of the most important film festivals in the world and becoming, at the same time, the first Romanian film to receive the Golden Bear Award. Thus, after two triumphs in the film shorts Berlin competition (Cigarettes and Coffee / Un cartuş de Kent şi un pachet de cafea by Cristi Puiu and A Good Day for a Swim / O zi bună de plajă by Bogdan Mustaţă, which were distinguished with the Golden Bear award for film shorts in 2004 and 2008, respectively), New Romanian Cinema has now earned a Golden Bear for a full-length movie as well. The trophy was given to the film director by the famous Chinese cinematographer Wong Kar-wai, President of the 2013 jury. A day earlier Călin Peter Netzer was also awarded the FIPRESCI Prize (by the International Federation of Film Critics), yet another premier for a Romanian production at the Berlin Film Festival. Child's Pose, whose screenplay is co-written by the director and by one of the best known Romanian screen writers, Răzvan Ră­du­lescu, deals with the difficult relationship (or "semipathological", as Călin Peter Netzer called it in an interview with Cineuropa) between a mother and her son. The mother is excellently played by Luminiţa Gheorghiu, a familiar name among New Romanian Cinema, starting with two of Cristi Puiu's films, Stuff and Dough / Marfa şi banii and The Death of Mr. Lazarescu / Moartea domnului Lăzărescu. At the same time, Gheorghiu is one of the few Romanian actors who collaborated with Michael Haneke, currently one of the best regarded European directors. The role of the son constitutes a second remarkable role for Bogdan Dumitrache, following the one two years ago in Adrian Sitaru's film, Best Intentions / Din dragoste cu cele mai bune intenţii. It appears that Răzvan Rădulescu specialized - both as screenplay writer and as director - in such subjects: First of All, Felicia / Felicia, înainte de toate (2009), written and directed with Melissa de Raaf, Principles of Life / Principii de viaţă (2010) by Constantin Popescu, along with the Bulgarian film Shelter / Podslon (2010) by Dragomir Sholev, all belong to the same thematic universe. Nonetheless, in this case, the director bears responsibility for the biographical bent of the film. Călin Peter Netzer confessed, in the aforementioned interview, that the point of departure for the screenplay was his relationship with his own mother, which he subsequently fictionalized. On a cool spring evening, while charging down the highway 50 kilometers above the speed limit, Barbu runs over a child, who dies shortly after the accident. Under normal circumstances, the 32 year old driver would face between 3 and 15 years in prison. However, at this moment Cornelia, Barbu's mother, intervenes decisively. She bends over backwards, utilizing channels that aren't exactly legal (such as bribing the eyewitness to change her story, or the parents of the victim, to withdraw the charges), so that her only child won't be accused of a crime and incarcerated. Cornelia is a parent who refuses to accept that her son has become a grown man. She maintains a stiflingly protective attitude towards him, as if Barbu were a helpless child. Consequently, she can't accomplish anything but distance him further. For as long as (driven not only by maternal love but also by a self-preservation instinct) she doesn't offer her son the possibility to assume responsibility for his own actions, Cornelia also refuses to face her family's real problems. We don't expect these actions from a representative of the educated middle classes (an architect who decorates her bookshelves with unopened works by fashionable authors such as Herta Müller, and who displays with pride her credit cards). Yet, in the same interview, Călin Peter Netzer states that, in his opinion, this behavior is much less prevalent in the working classes, as well as in Western societies, including Germany. In the the former Eastern Block nations, however, such a possessive and domineering parental attitude towards children is common. Child's Pose is a penetrating and moving psychological drama (which also has comical moments), filmed by the cameraman Andrei Butică in an almost documentary style. The title refers to a yoga position exercised by the mother. Even if that scene was cut from the final film, Călin Peter Netzer kept the original title, which symbolized to him Cornelia's incapacity to allow her son to lead his own life awhile also depicting Barbu as his mother's victim (and, we might add, also served as a symbol of the accident that constitutes the central plot of the movie). Furthermore, aside from revealing the amorality of the new middle classes, the film raises questions about the entire socio-economic system where truth and righteousness are on the side of those who have financial and/or political power.